Our linens come in a variety of styles, sizes and colours to match any style and budget! Our satin linens provide an elegant finish to your decor. The satin linens are available in tablecloths, sashes, runners and napkins. The damask and swirl linens provide dimension to an otherwise flat surface. The come in an assortment of colours as tablecloths and napkins. The polyester linens provide a crisp look for your event. Tablecloths, overlays, and napkins are available in the polyester in a variety of colours. Our sequins tablecloths bring that wow factor to the table! Available in silver, champagne, blush and navy. 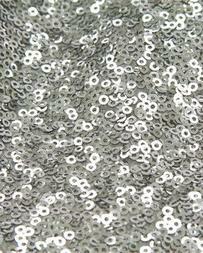 We carry the tablecloths and runners in the sequins material. 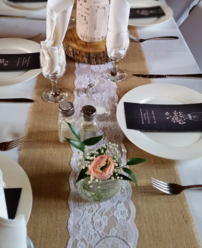 The pintuck linens provide some texture to the table. Available in tablecloths as well as runners. All pricing subject to change without notice. Pricing subject to applicable tax. We offer burlap runners with or without lace in the middle.